A childhood in Canada during World War II, raising a family in California, and finding paradise on Maui. Carol Murdina Maud Bull lived a life filled with drama, adventure and true love, buoyed by gratitude and her faith in God. A Hand on My Shoulder features twelve essays written by Carol, along with transcribed interviews with both her and her mother, Mary MacDonald Raynard. This book captures what life was like in Canada and the United States during much of the 20th Century. She shares memories of growing up in Canada during World War II, when German prisoners of war worked doing manual labor in her town. 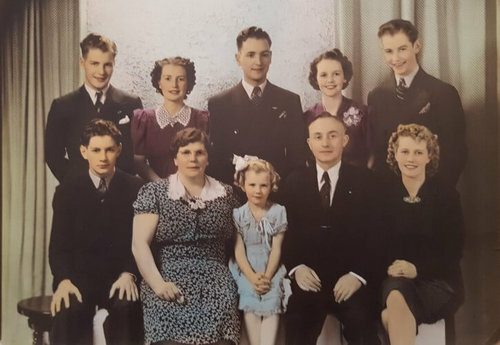 The men in her family had gone to fight; one uncle came home a hero, one came home shell-shocked, and one was shot down over Belgium and never returned. She writes about working as a surgical nurse for ground-breaking surgeons during the early days of heart transplant research, and how she had to choose between career and family. She was the nurse and manager for her husband’s medical practice in San Francisco, where, early one morning, a patient almost shot her with .22 bullet from a Saturday Night Special. In 1972, she found paradise on the island of Maui, where she lived her happiest moments with her husband and family. Her first essay in the collection, Where Were You During World War II? Has been accepted into the permanent collection of the Canadian War Museum, in Ottawa, Canada. This book is fast becoming a hit with book clubs. Get your copy today! All proceeds will go to Habitat for Humanity, one of her favorite charities.